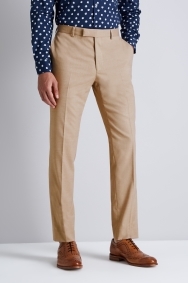 These Moss London trousers are made to get you noticed. Cut in a skinny fit, they taper closely to your legs to carve out a defined frame. 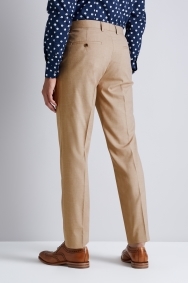 The warm cappuccino tones will make you stand out from the usual navy and grey, and the tortoiseshell buttons on the back pockets add vintage charm. Offset the neutral tone with a rich shirt, preferably with a pattern to bring extra on-trend personality. A pair of brogues completes the classic look. It’s time to let your legs take centre stage in a pair of skinny fit trousers that hug your form and create a smart silhouette. The perfect pairing with a skinny fit jacket, this style is dapper and current. The close cut lends an edgy twist to formal dress and everyday workwear alike. Excellent customer service and great quality suit. Great product at a decent price. Very comfortable fit and appears to have been manufactured to a good standard. Fantastic suit for the summer. very comfortable and a perfect fit. Lovely, smart suit that will serve me well for the summer. Again a very nice and comfotable suit.